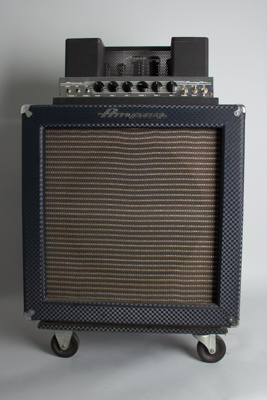 Ampeg B-15N Bass Model Tube Amplifier (1965), made in Linden NJ, serial # 020571, blue checked Tolex finish. Height is 29 in. (73.7 cm. ), 21 in. (53.3 cm.) width, and 13 3/4 in. (34.9 cm.) deep. This is a very clean and well preserved example of the all-time classic recording bass amp, Ampeg's B-15N. We see many period B-15s, but few present as nicely as this one! Internally there has been some recent cap work, but no circuit alterations. There is some typical light wear overall, the only real cosmetic issue is the inside top corners of the exposed transformer housings have old tape added where they rubbed against the speaker in the transport mode position and lost some of their outer finish. Over time this "baked" on somewhat and the residue is not easily removable. Other than this the amp shows no cosmetic alterations. The original speaker and transport dolly are both intact and working fine, and the original blue checked vinyl cover is even present. A lovely example overall. Overall Excellent Condition.